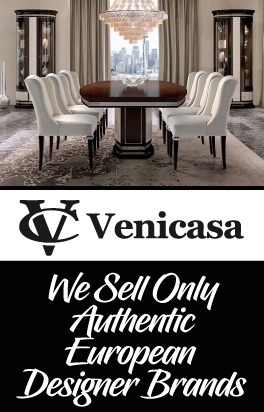 We carry Full Italian Style Dining Room Designed Sets, or you can purchase Dining Room Tables or Dining Room Chairs Separately. 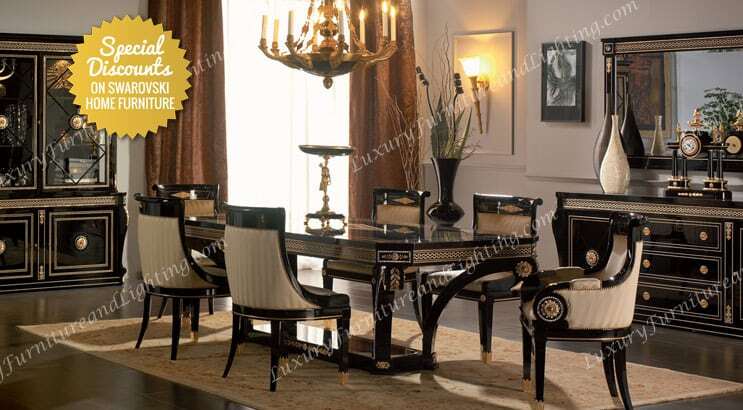 Luxury Furniture is one of the Largest Italian Style Dining Room Furniture & European Style Furniture Companies on the Internet. 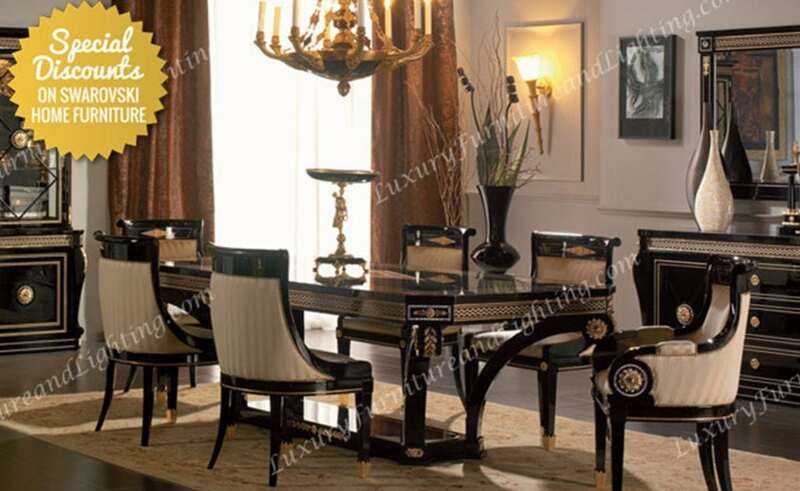 Luxury Furniture and Lighting proudly presents the Swarovski Classic Italian Dining Room collection of dining room furniture. 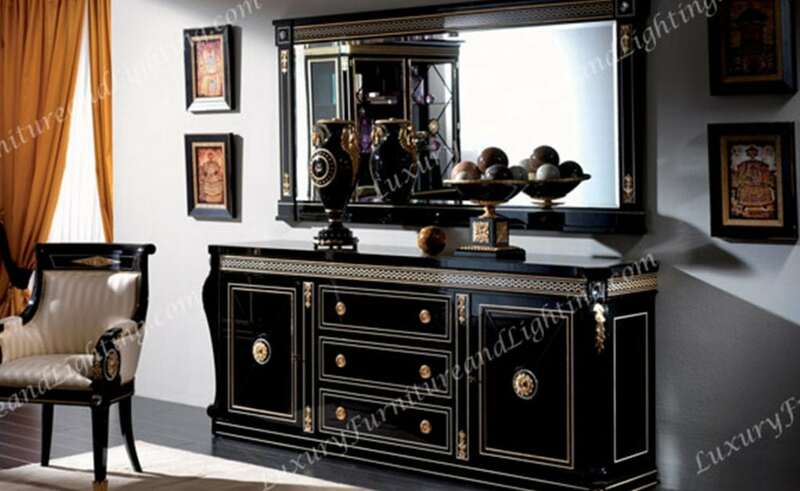 The Swarovski Dining Room collection is comprised a Black Swarovski Rectangular Dining Room Table, Swarovski Arm Chair, Swarovski Side Chair, Swarovski Showcase Cabinet, Swarovski Buffet and a matching Swarovski Mirror. 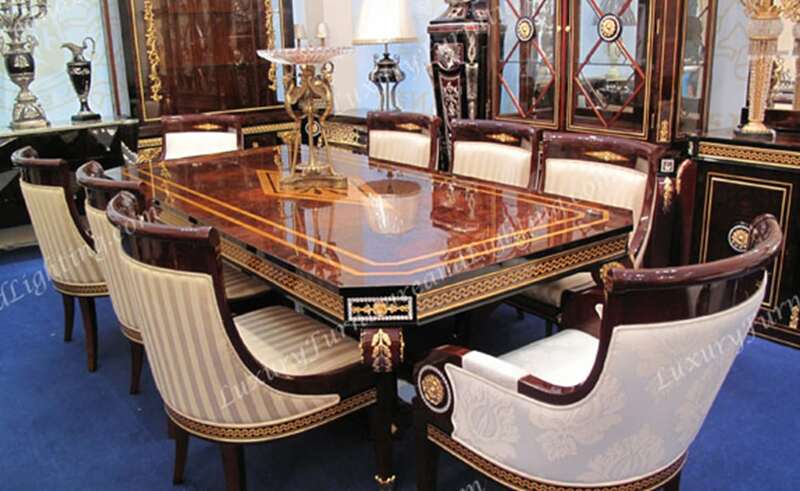 The Swarovski Classic Italian Dining Room collection is an extremely Beautiful line inspired in the Neoclassic Russian Empire style, combining natural sycamore veneers with bronze parts in shining gold finishing, emphasizing it’s splendor with dedicated Swarovski crystals. 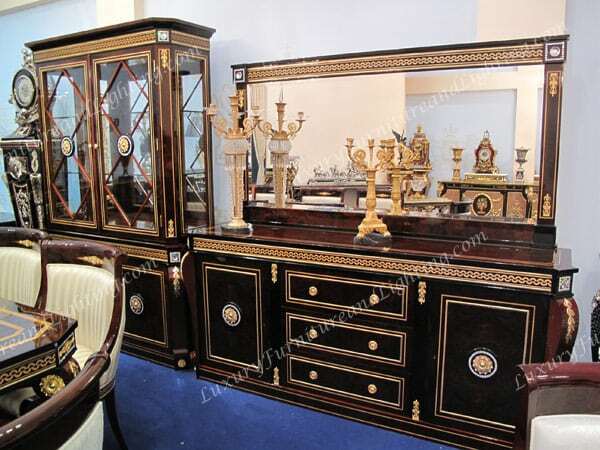 Classic European furniture at it’s finest! 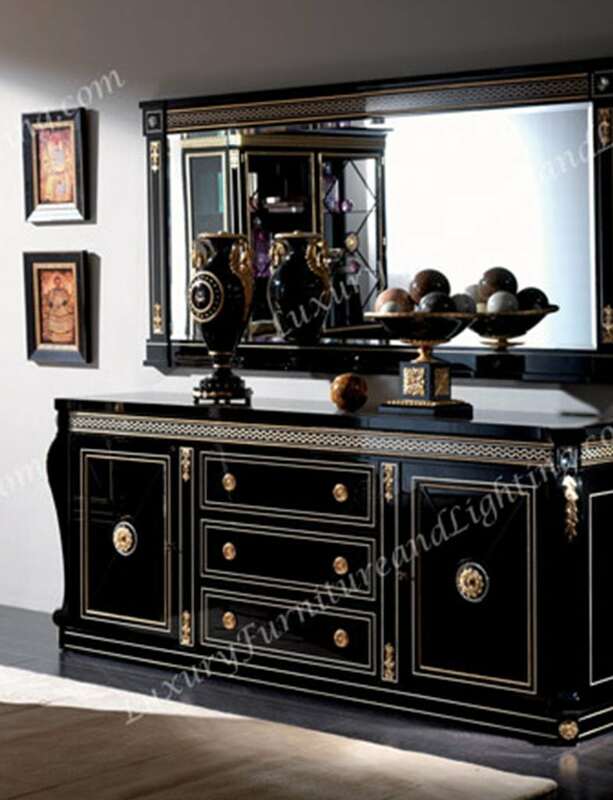 Available in sleek black or walnut burl finish. 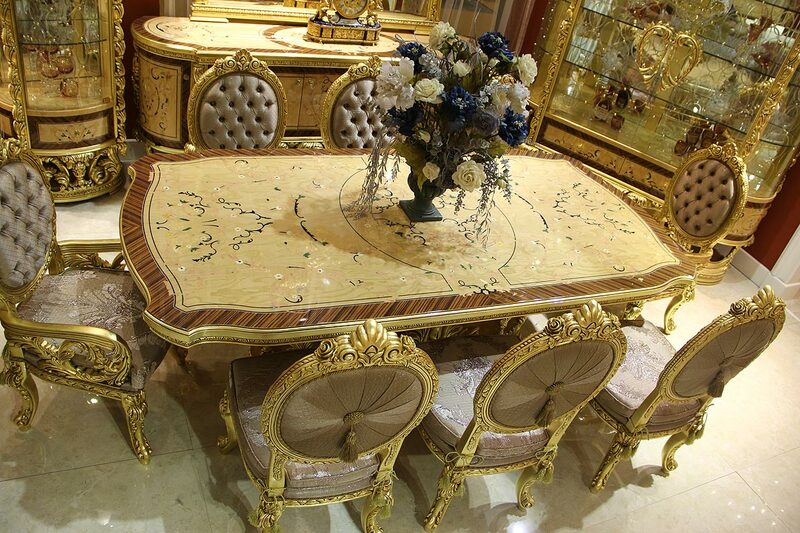 Our Swarovski Dinning Room Furniture Collection will be the focal point of your Dinning Room. 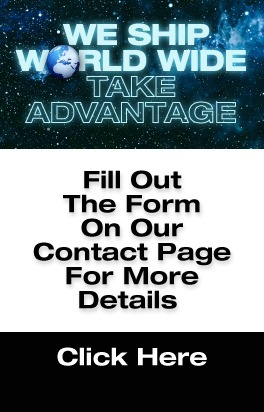 You can host Dinner Engagements and Parties that will make your friends and neighbors envious. 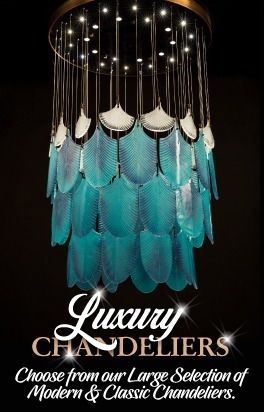 The Swarovski Dinning Room Table is a supremely beautiful piece. 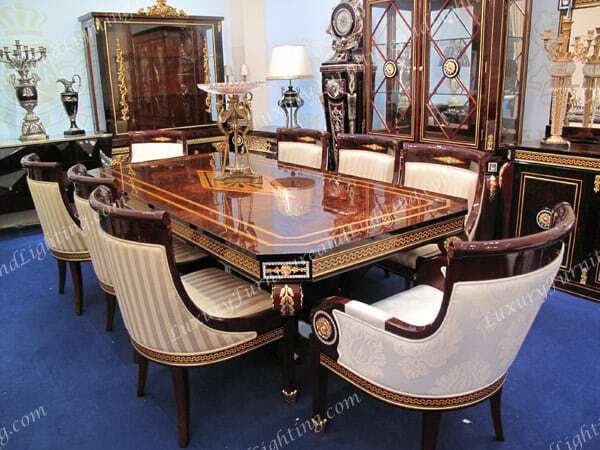 This Dining Room Table is perfect for large dinner gatherings up to seating for eight. 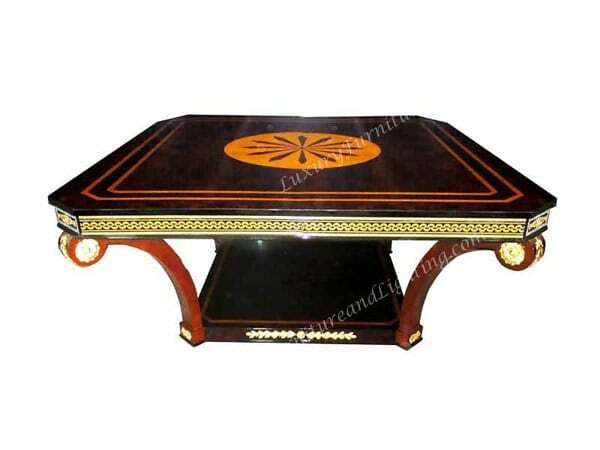 The Dining Room Table is rectangle and supported by four carved sheer black or Walnut wooden legs outlined with Swarovski Crystals and Brass. 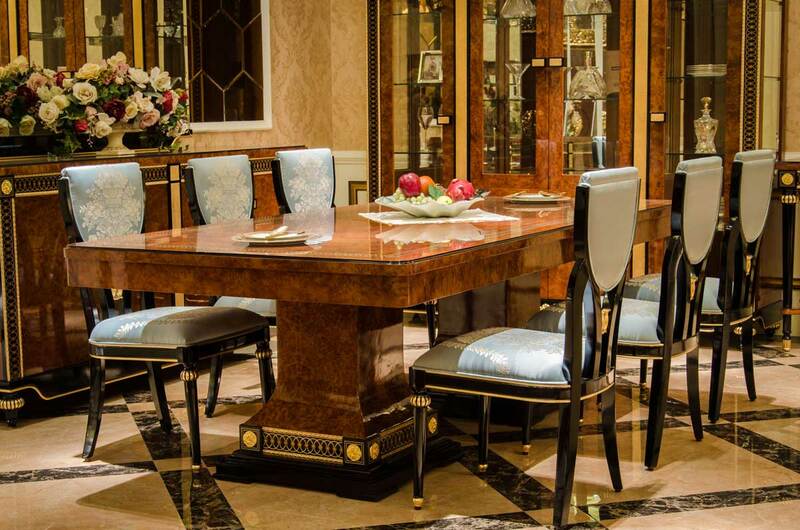 The Swarovski Dining Room Chairs offer pure comfort and elegance. 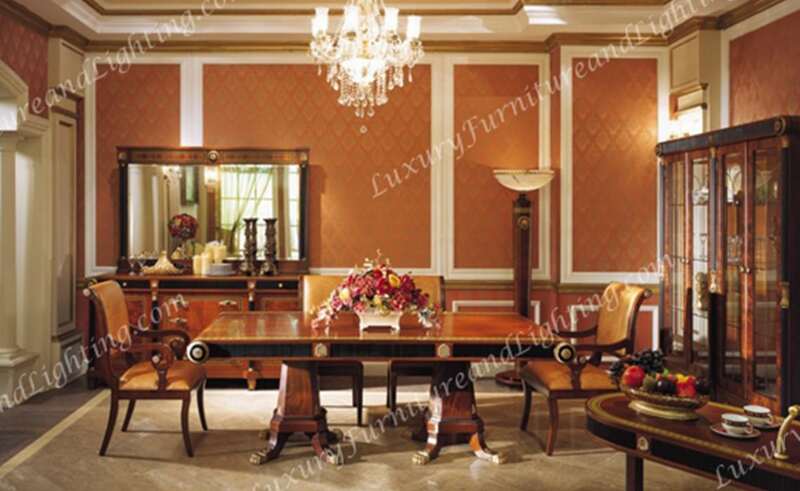 The Head and the end of the table Dining Room Chairs have curved armrests and different upholstery. The side Dining Room Chairs do not have armrests so that the chairs are able it as many quests or family members as possible. 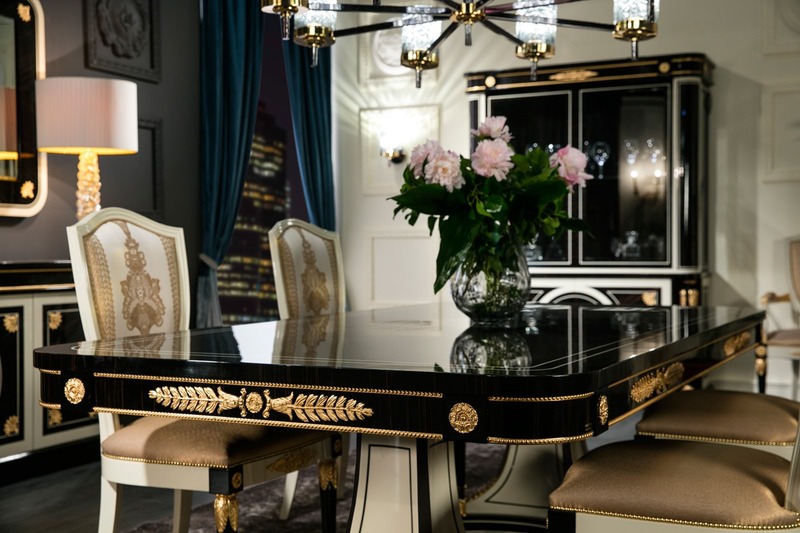 The Swarovski Dining Room Chairs are crested with Swarovski Crystals and Brass. The Swarovski Buffet piece enhances the Dinning Room Table and Chairs. 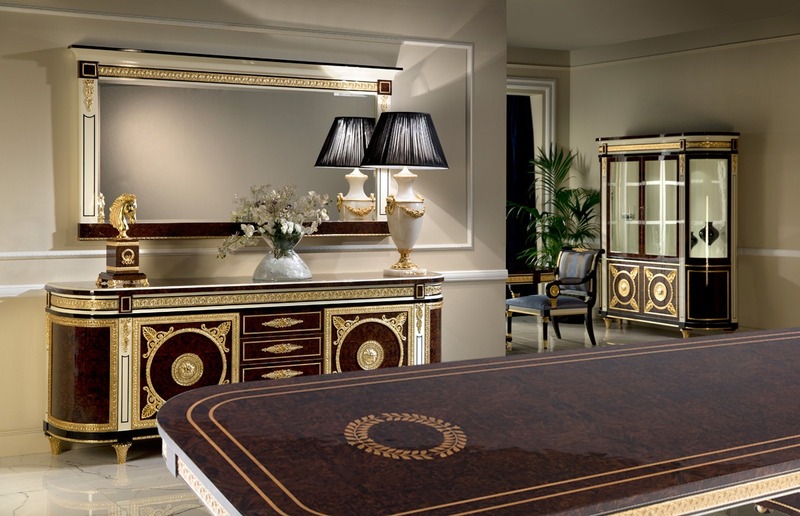 In certain areas you can see the craftsmanship and the purity of the Classic Italian, European, Russian style furniture craftsmanship. The Buffet has a huge mirror that outlined the whole Buffet Table. 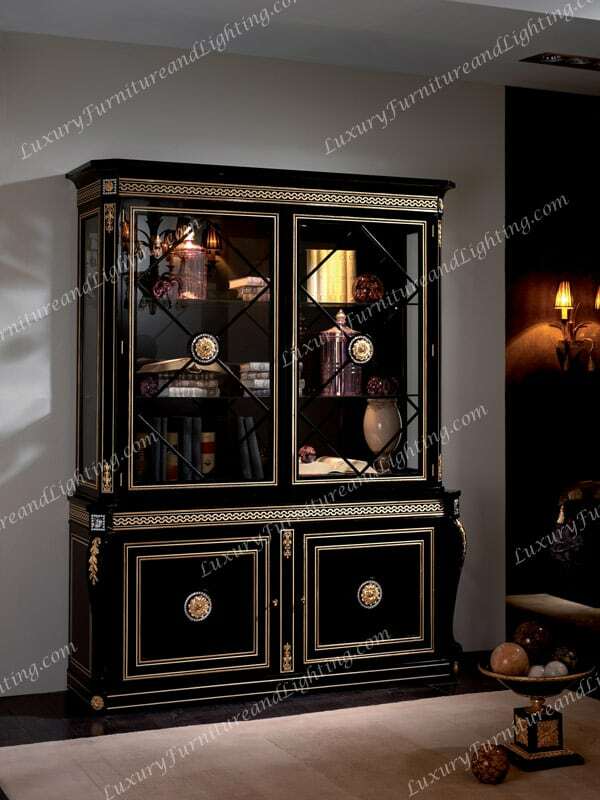 Swarovski Room collection Showcase Cabinet is where you can show off your finest China, Crystal Dinning Ware plus your top self wines and liquors and or your Prized Swarovski Pieces. 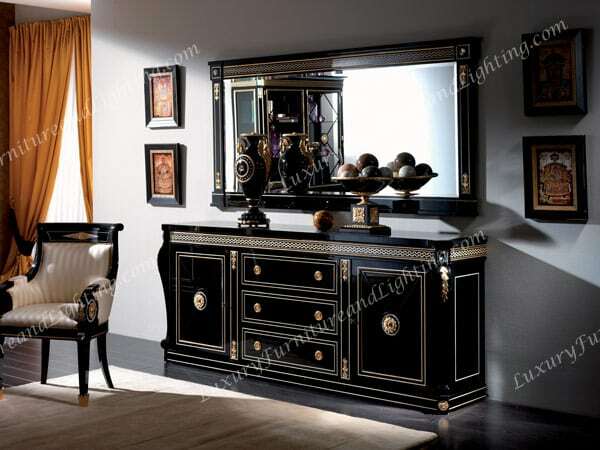 Please feel free to browse through our online Classic Italian Furniture Catalog. 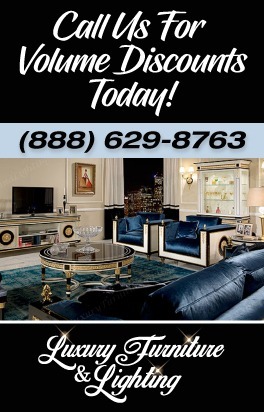 If you have any question please call Toll Free @ 888.629.8763 Thank you for selecting Luxury Furniture and Lighting.